For NANO Antivirus Pro we use a completely new, flexible and handy license system. With this system, you aren't required to decide in advance how many devices you need to protect right now or in the future. We provide you with sets of protection days1, which you can use in accordance with your purposes, dividing them among a necessary number of devices2. Moreover, you get additional bonus days of protection if you activate the license on additional devices! No linkage to the number of your devices. Bonus days for the activation on additional devices. You can share your license. Let use as a sample the license «NANO Antivirus Pro 500 days». If you activate it on one PC you get the number of days which equal of nominal of the license that is 500 days of protection. Then you can activate the same license on one more PC, and the remainder of protection days will be divided between two devices. As a bonus for the activation, you get additionally 230 days of protection which also are divided between two devices. As a result, you get 730 days of protection in aggregate or 365 days for each PC which permit you to protect two devices for 1 year. 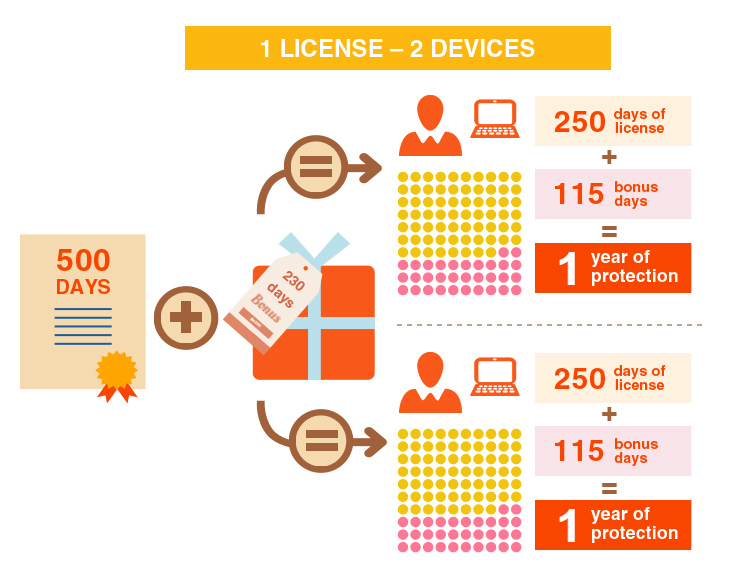 On activation of the license for the third device, you get additionally 50 bonus days, and the balance of your license is 780 days of protection which are divided equally among all your devices. Then you can activate your license for additional devices until the remainder of protection days reaches the minimum in accordance with the rules. On each activation, the remainder of protection days is divided among all devices. You can protect an additional device in any moment after the first and next activations if the remainder of protection days including bonus days is not less than the allowed minimum. The minimum remainder of protection days for one device is 90 days. 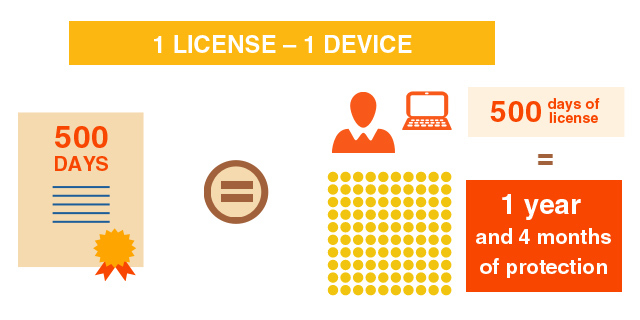 Sometimes it is possible you need to deactivate a license for one or several devices. It can happen in the case of loss, breakage or exchange of a device on which a license is activated. Also, deactivation can be necessary on the reinstallation of an operating system and for some other situations. In that case, you need to address our technical support service. Attention! You must have an access to the email which was used to activate the license. 1 Protection day is the period of protection of one device within one day. 2Can be limited by the type of the license and the limit for the minimum days of protection for one device. 3Is valid for the day of the publication. Can be changed without a prior notice. Is not a public offer.